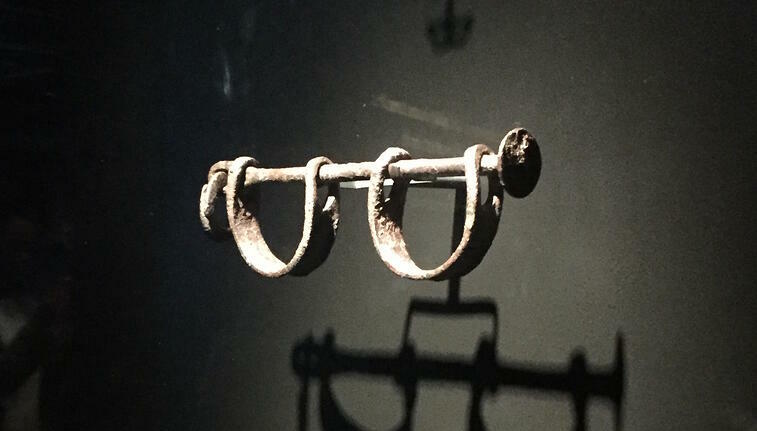 Child shackles at the National Museum of African American History and Culture. Photo courtesy of Valerie Linson. The child-size shackles stop me in my tracks. It is one of the first artifacts on view at the National Museum of African American History and Culture in Washington DC. Just below the child’s shackles are a larger pair—for a parent perhaps, hopefully, but most likely not. I stop to consider how many pairs of shackles were needed in that monstrous journey of the Middle Passage, when captured Africans were brought to the New World. And as an African American, I know that I have a very particular connection to those shackles. But as with any tour, the journey continues and I don’t stay rooted in front of those shackles. The fluidity and pace of touring this Museum is one of its least obvious strengths. It is very appropriate that the history of Africans in America begins with the slave trade, indeed, the experience of the Museum begins below ground level in a cramped, dimly lit space, akin to the bowels of a slave ship. But like the history of African Americans, the journey wends its way upward, through struggle and progress to the familiar stories of today that are becoming history in the making. One of the things the Museum does beautifully is to fill in the story of the African American experience by placing the remembrances of well-known historical figures right next to those whose life stories we’ll never know: Harriet Tubman’s hymnal and shawl sit directly across from a tattered pillowcase given to a child sold away from her mother. The recreated train car that would have carried thousands travelling north seeking refuge from a violent south, is adjacent to the room where Emmett Till’s casket is on view. As the name suggests, culture is very much a part of the experience of this Museum. It also felt like the least complete part of this journey, perhaps because culture is ever evolving and difficult to plant in one place and time. But the artifacts—large and small—were incredible! Where else can you have Chuck Berry’s Cadillac around the corner from Prince’s tambourine near a display of Marian Anderson’s gown? The sheer throngs of African Americans coursing through the veins of this building said to me that we are hungry for our story to be told, recognized, celebrated; the Museum lifts this history off the page and out of our collective psyche. In the rush of the crowds there was almost a frenzy to absorb everything; there was almost too much to take in. And there will surely be new exhibits as artifacts are added to the collections. How this museum will grow is especially significant: many of the artifacts were donated by people who have had these articles in their families for generations. I for one am deeply grateful. We as a nation are indebted to them for their determination to have kept these relics safe and their tremendous generosity in sharing these treasures with the world. The Museum seeks to tell the American story through the lens of the African American experience, and in so doing, it is a gift to teachers. Many of the items in the collection are available for viewing online. Difficult classroom conversations around race and American history are buttressed by artifacts to tell the story. But along with the difficult conversations are the validations of progress, success, and invaluable contributions to the life and culture of this country made by African Americans. The Museum brings to life the lessons of a complicated history with an immediacy that sometimes escapes the written word but most importantly, doesn’t have to remain a faint memory. "Emmett Till: A Series of Four Lessons - Meant to accompany the film, "The Murder of Emmett Till," these lessons help put the significance of this murder in context to the Civil Rights Movement. "The World the War Made" - Part of a series of video-based web lessons from our resource, The Reconstruction Era and the Fragility of Democracy, "The World the War Made," helps frame some of the ways the lives of Americans changed after the end of the Civil War, especially African Americans who were newly freed from slavery. "Eyes on the Prize: America's Civil Rights Movement 1954-1985" - Use the four lessons in this unit to explore the strategy of nonviolence that African Americans implemented during the Civil Rights Movement to achieve justice.